Quick show of hands: who doesn’t like deep fried chicken? Anyone? I haven’t met anyone who hates deep fried chicken. We may not savour them as often as we like due to obvious reasons, but just hearing those three words alone is sufficient to stimulate my salivary gland. How I wish there’s no such thing as high cholesterol and saturated fat! How I wish one day nutritionists will declare that fried chicken is healthy! Well, we can all agree that that day is never going to arrive. But as Nigella Lawson would say, it’s not all or nothing (quoting her in Nigella Bites). 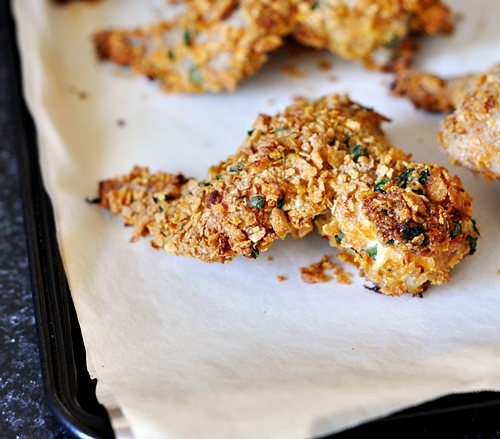 There’s a middle ground: oven baked “fried” chicken. Note: Just so you know, I’ve seasoned the chicken directly instead of the flour, which, contrary to Lorraine’s method. If you ask why I did that, uhm, all I can say is “through force of habit” (sorry about the unscientific answer 🙁 ). 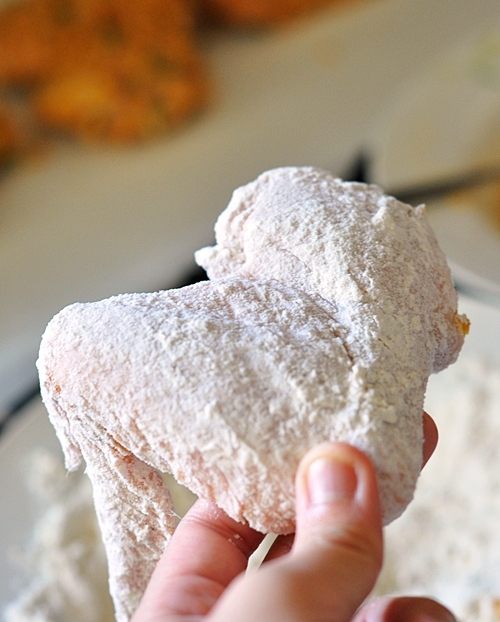 Chicken or flour, I reckon you can season whichever way you wish in this instance, right? 1. Preheat oven to 180C/350F and line 2 baking trays with parchment. 2. 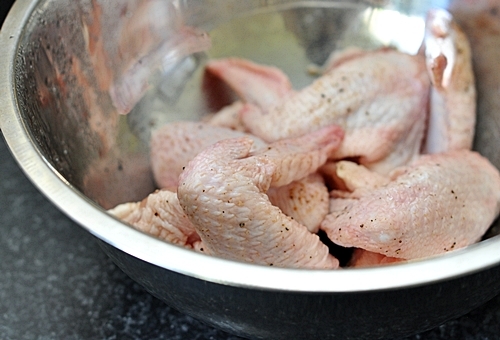 Marinate the chicken with salt and pepper. 3. Place flour in a shallow plate. Beat eggs in a wide bowl until well beaten. Place the cornflakes in a ziplock bag and summon up your inner Jerry Springer (quoting from Lorraine) and bash at the cornflakes with a rolling pin. Too lazy to find your rolling pin? Clench your fist and “hammer” it instead (which was what I’ve done). 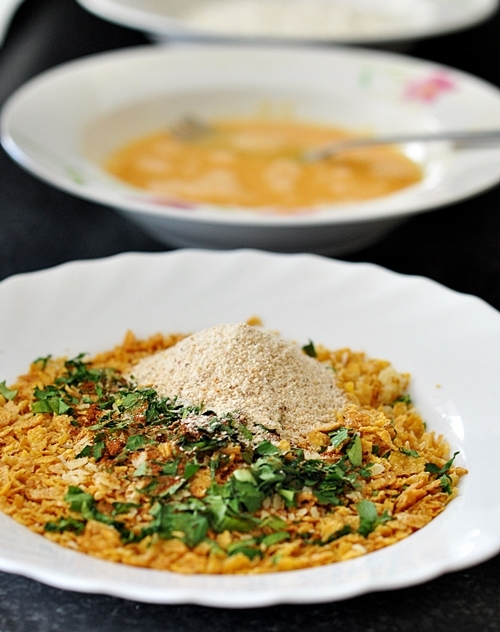 Mix the cornflakes with the chopped parsley, breadcrumbs and parmesan and place on a large shallow plate. 3. 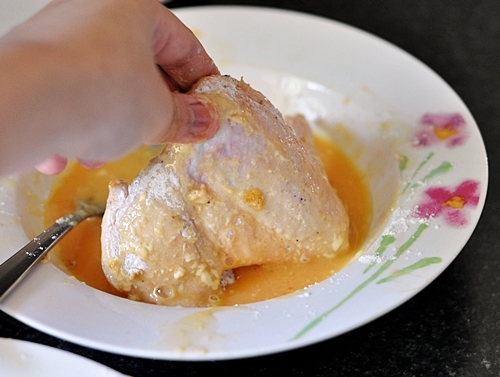 Roll the chicken pieces in the flour, then roll them in the beaten egg and then the cornflakes. 4. Place in the oven and bake for 15 minutes. Then take the chicken out of the oven and drizzle a tiny bit of oil (less than a teaspoon per wing really) and then place back in oven and cook for another 20 minutes. Thanks Lindsey. I’m glad they turned out to be flavourful and crunchy. Thanks to the cornflakes and parmesan! When the baking was almost finish, I thought I smelled the similar scent as KFC (it’s a good thing in my book, hehehe! Your photos are delicious looking! Great recipe especially to get the deep fried flavor without the guilt. Yum, I’ll have to try this. At least it’s baked, which is better than what I usually do. Look very tasty, great pictures! 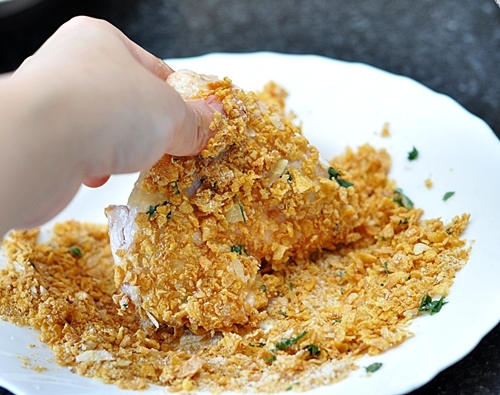 I feel like everyone always wants fried chicken without having to deal with the mess! Looks yummy! 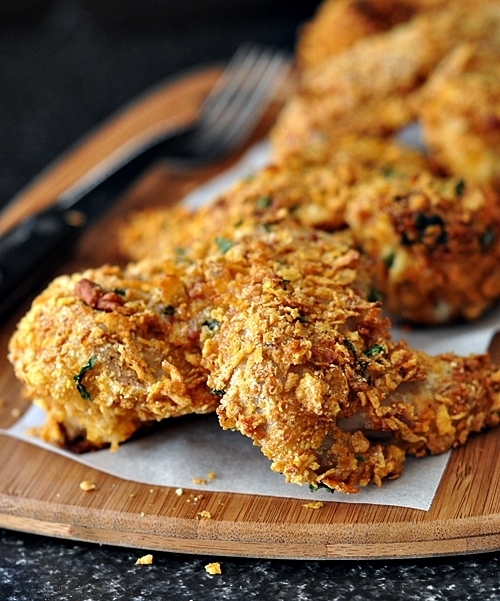 With so many fried chicken recipes out there, this one is leading the fried chicken race. May I just say that this looks so much better than the original version? I can’t wait to try this out! Representing all the way from The Netherlands (Europe). I wanna eat it! Especially it’s not even fried! 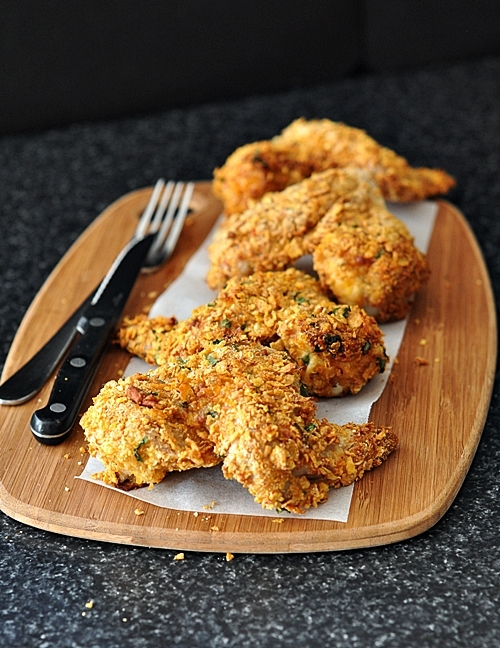 This chicken recipe reminds me of Kentucky Fried Chicken. I love KFC. I agree that I wish there was no such thing as high cholesterol. If we cook one unhealthy food then we need to cook five healthy recipes. Although KFC always makes me happy, I try avoiding deep frying food in my kitchen because of the oil left over, the smell of oil in my small kitchen and on my hair, and yeah, the health reason. Never thought of baking a “fried” chicken other than chicken wings before. Will try this soon! Thanks! hello emily.I am very new to the use of a computer.so, i really want to quit this 2nd time, and just thank you for your chicken recipie and i have saved you to favorites. i take care of my dad and cook for him. if i do it right, he will love it. thank you.